HF communication is all to do with the fickle ebbs and flows of the ionised layers which surround the Earth. These are all far above the troposphere in which we live and breathe and which does not reach much beyond the height of Mount Everest. The F-layer between 120 and 180 miles high reflects HF signals. It is like a spherical shell around the Earth with its inner surface 'silvered' to act like a mirror to radio sign­als. It is strongest during winter days, and it is most reflective to signals at the high end of the HF spectrum. It still reflects at night, but mainly towards the lower end of the HF spectrum. Under the hot summer sun, the F-layer splits into two weaker layers F1 and F2 and becomes less effective than during the short winter days. However, it re-mer­ges into a single stronger layer during the short summer nights. The E-layer at 60 to 100 miles high absorbs signals more at the lower frequency end of the HF spectrum and less the higher in frequency you go. Its effect is strong during the day, but it still lingers at night. The lowest is the D-layer at 20 to 50 miles high. It absorbs HF radio signals. It is only there during the day, and often not at all in winter. I always like to note relationships. For instance, that the Ozone Layer, which is in a narrow shell of the atmosphere where temperature stops rising with height and starts to fall instead, is just about where the D layer begins. The temperature reverses again and starts again to rise with height at 50 miles above the ground where the D-layer ends and the E-layer begins. But perhaps the most intriguing observation is that space stations, shuttles and many satellites orbit the Earth below the F-layer. These layers both absorb and reflect HF radio signals. The extent to which they do so differs with frequency, time of the day, time of year, and the position of the year within the 11-year solar cycle. This causes the best frequencies for long distance contacts to vary considerably. 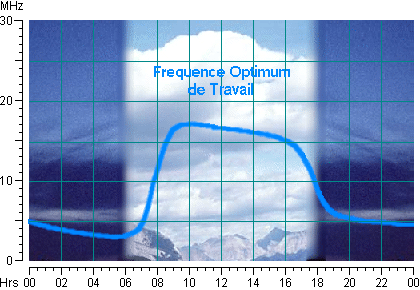 The daily variation in the optimum working frequency (generally known by its French name Frequence Optimum de Travail [FOT] is shown below. It is readily noticeable that the efficiency of long distance communication conven­iently follows closely the daily cycle of human activity and alertness. However, as is implied by the mountain scene, the efficiency of long distance communication is affected more by the time of day half way between the sender and the receiver than it is by the time of day at either end of the transmission path. In summer, the daytime-high lowers and the nighttime-low rises, giving less varia­tion between night and day. In winter the daytime peak rises and the night time minimum lowers producing higher contrast between night and day. The effect of the 11-year solar cycle is to shift the whole curve upwards and downwards. At the height of the solar cycle the peak can reach to over 50 MHz. The higher the FOT the less power you need to communicate over long distances. At the height of the solar cycle people can reputedly make contact by Morse code with the other side of the globe using transmitters no more powerful than a torch bulb. The diagram below gives a general view of the ranges of frequencies or propa­gation bands over which long distance ionospheric communication can take place and when. The coloured scale on the right shows how the different propagation bands have been allocated to different uses by international agreement. Each type of user thus has one or more slices of 'frequency space' within each propagation band. During the day, signals above 15 MHz provide the most efficient long distance com­munication. However, at night the F-layer becomes weaker and loses its 'silvering' to signals on these frequencies. They punch straight through it and are lost to space. During the daytime, signals on frequencies below 10 MHz get too much absorbed by the lower layers to get very far. Stations at these frequencies are like light houses in thick fog. But at night the fog clears, and with enough power the high F-layer refl­ects their signals across the world. Frequencies between 10 and 15 MHz can be used day and night. They offer us the convenience of round-the-clock communication in return for somewhat more power than would be necessary at the higher daytime-only frequencies. The sun spot bands become extensions of the ionospheric frequency ranges during the height of the solar cycle. Within the line of sight frequency ranges communi­cation is only possible as far as - or in some cases a little beyond - the horizon. Ground wave communication can occur at low frequencies. Here the electrical nat­ure of the soil and sea cause signals at frequencies below 300 kHz to hug the sur­face of the Earth. With sufficient transmitter power signals on these frequencies can circumnavigate the globe. 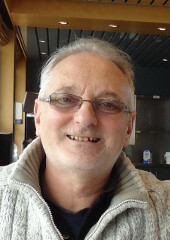 The neatly classified bands with their neatly classified behaviours and their predict­able periodicities are only a very rough approximation to the truth. The ions of the upper atmosphere are eternally relaxing back into neutral atoms and dissipating energy in the process. The whole system must be continually pumped by incident energy from the sun in order to remain ionic. Like the weather system far below it, the ionosphere is a periodically-driven dissipative complex dynamical system. As such its behaviour must to some extent be chaotic and hence must contain an ele­ment of unpredictability. It is this unpredictability that I find interesting and challenging. A radio path to some far off land can open and close as if with a mind of its own. Signals can suffer flut­ter, fading and distortion; and then, for a fleeting interlude, re-emerge into crystal clarity. Thus does a broadcast from a far off land not only give us a view of the alien culture from whence it comes, but in so doing also takes upon itself the very ess­ence and character of the void through which it passes on its epic journey to our ears. A most unpredictable phenomenon, so far unmentioned, occurs in the E-layer. It is called Sporadic-E. Sometimes, mainly during the long days at the height of summer, individual ionised clouds form in the E-layer between 56 to 100 miles above sea level. They funnel radio waves, by repeated internal reflection, rather like an optical fibre does with light. On occasions, these ionised clouds can be extensive enough to open brief windows of communication over distances from 500–1375 miles. Perhaps the most interesting observation about Sporadic-E is that it is effective over a frequency range way above the limits of normal ionospheric reflection. It is a VHF phenomenon affecting transmissions on frequencies nominally between 27 and 110 MHz, although the phenomenon can, at times, affect transmissions on frequencies up to 250 MHz. Although this unpredictability adds spice to the hobby for the amateur short wave listener, it is an inconvenience for the professional. The use of HF for mission critical applications like exception message networks demands a higher degree of reliability and hence predictability. It is to this end that I have been studying the feasibility of neural networks for 'learning' when different HF radio paths are likely to be open. A great general is preparing for battle. He knows his enemy. His formidable opposite number on the other side will adopt one of three strategies. He must be prepared to counter any one of them. He therefore prepares three grand plans, one for each of the three possible strategies his enemy may adopt in the forthcoming battle. He calls them Plan A, Plan B and Plan C. In the months before the battle messengers shuttle back and forth. They are carrying piece by piece the immense detail of each plan. Then, when his enemy strikes, the general decides which plan is he must execute in order to defeat his enemy. He sends a simple abrupt message to all his company commanders. It simply reads: "Plan B". The message is very short. But it conveys an immense amount of information on how the battle should be fought.